Earth's End: Terry Teo (finally) back on Television! Terry Teo (finally) back on Television! 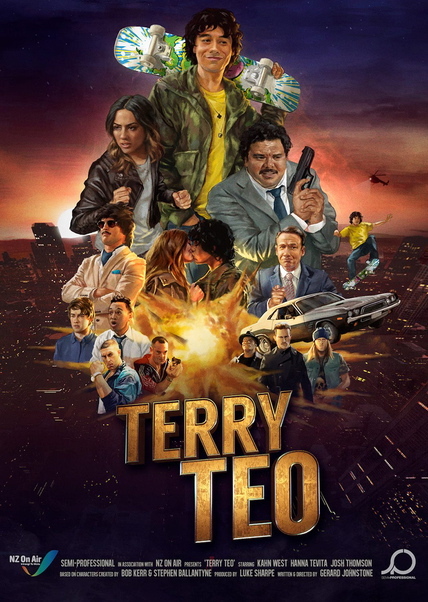 Above: The new Terry Teo series. Copyright Semi-Professional Pictures 2016. Terry Teo is back on television! After much media discussion and controversy earlier this year when the show debuted on TVNZ's Ondemand, it has finally found a place on the network's schedule: debuting this Sunday at 7pm on TVNZ 2 with a 2 hour double episode update of the 'Terry Teo The Gunrunners' storyline. To order the original graphic novel, with a background history of Terry Teo and the making of the new TV series, you can order it directly from us HERE. If you are a retailer and would like to stock the book, you can contact us at: earthsendpublishing@gmail.com. "Great adventures. No iPhones, no internet. I think I even saw a red telephone box in there. Lots of car chases, bad accents, worse jokes...It's going to be popular with young boys." "It’s all jolly good nostalgic fun, with a distinctly kiwi flavour to the illustrations – including the charmingly-named small town Kaupati (say it aloud) with its tiny police station and A&P show. This is truly like travelling back into a time before cellphones, before the internet, into a world where kids get to have the adventures – because the adults are too oblivious or silly to solve the problems themselves. With its fast pace and humour, this graphic novel can now be enjoyed by a new generation, and may especially be embraced by the more reluctant reader." "Bob Kerr’s cartoons are terrific as always and there are lots of little in-house jokes and Kiwi things going on that are smilers when you see one. Stephen Ballantyne’s written text is to the point and captures the whole Kiwi attitude. This book has high appeal for reluctant readers and is certain to win fans at primary and intermediate schools all over again." Earth's End at NZ Book Festival 2016!